FLASH: Music Everywhere: The Rock and Roll Roots of a Southern Town won the Florida Book Awards 2016 Bronze Medal for Nonfiction. To learn about PIANO LESSONS click on the Piano! To check out my 1997 book "Start Your Own Band", click the book! 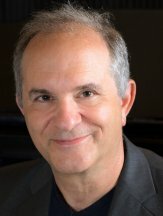 To go to my Music Education site (www.martymethod.com) and order The Marty Method, click on this book! Marty Jourard was born on an August 25th, just like Elvis Costello, Sean Connery, Walt Kelly, Wayne Shorter, Leonard Bernstein, Claudia Schiffer, Gene Simmons, DJ Terminator X, Bret Harte, Tzar Ivan the Terrible (1530), Clara Bow, Regis Philbin, Mia Zapata, Rachael Ray and---tragically----Billy Ray Cyrus. Location: Atlanta, Georgia, at the Emory University Maternity Ward. Skills: Making omelets, playing musical instruments, collecting menus, vintage cookbooks, dust,and other ephemera. Somewhere in his childhood Marty learned to play keyboard and saxophone. 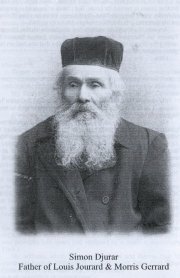 The early years were torturous for all within hearing range; however, through the rare practice session and a sort of aimless diligence—ever-mindful of the Jourard family credo Parvus passus pro mens parvus ("Tiny steps for tiny minds") —Marty slowly improved until people no longer wept openly when they heard him play. Fewer people anyhow. 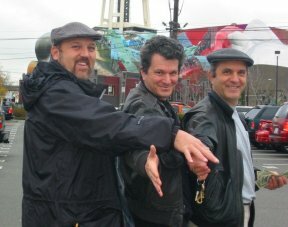 After thirteen years in Los Angeles, iin 1989 Jourard moved to Seattle, Washington where he now resides. Just like Florida, it rains a lot. Marty was in a band called the Motels and---decades before---a band called Road Turkey. Yes, folks: Road Turkey. Tremendous physical strength is a typical Jourard trait, and Marty's abilities are in keeping with his ancestry: he once broke a Vienna roll in half with his bare hands. He was drunk at the time, but could probably do it sober. Is there anything this promising lad can't do? Definitely. But why waste time on that? There's so little to do and so much time to do it! Wait. Scratch that. Reverse. O.K. There was something very odd about my childhood, as if everything was slightly askew. approximately 43 degrees to the right. Since we were all tilted 43 degrees, when we stood together, none of us knew it. This explains everything. (House of Mystery, St. Augustine, FL circa 1960. Back Row: Mom, Dad. Front Row: Leonard, Me, Jeff,) . Click on Sid's name on the column to your left for more about this interesting man, and listen to a lecture of his from 1971. I have decided to write poetry. Poetry is like prose but is more poetic. I was leafing through a Gourmet Magazine a few days ago and realized that advertising copy makes a darn good poem. Here is my first poem. In it I trace my relationship to the post-rational angst of consumer culture, more or less. 1 September 1997 - A British study, published in today's Psychiatric Bulletin, suggests that Ravel's Bolero, reputed to be the most often played composition in the repertoire, was the work of a pathological mind. Dr Eva Cybulska, the author of the study, claims that the famous melody repeated 18 times without change during the course of the piece demonstrates that the French composer was possibly succumbing to Alzheimer's disease. The Kent-based psychiatrist claims that perseveration, an obsession with repeating words and gestures, is one of the more notable symptoms of this pathology. In other words, the repetitive nature of the score's principal theme is symptomatic of the degenerative condition which began to trouble the French composer in 1927 at the age of 52. Was it really Alzheimer's disease or the budding tumor which later killed Ravel during brain surgery in 1937? We look forward to Dr Cybulska's diagnosis of the works of minimalist composers Philip Glass, Terry Reilly and Steve Reich. Absolute twaddle. Ravel knew precisely what he was doing: to write "...(an) experiment in a very special and limited direction, and [it] should not be suspected of aiming at achieving anything different from, or anything more than it actually does achieve. 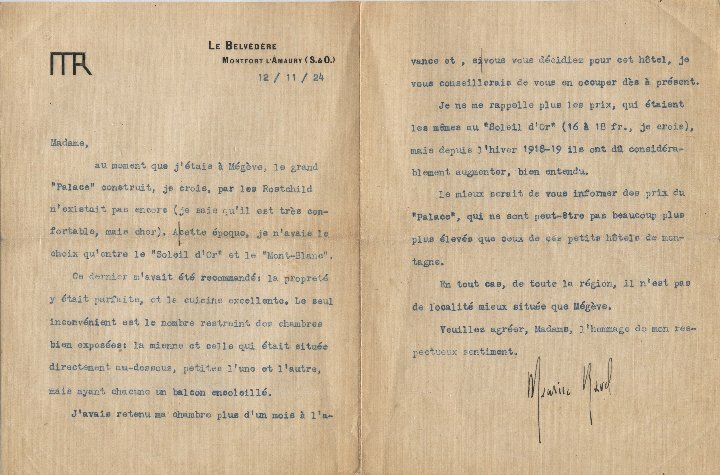 Before the first performance, I issued a warning to the effect that what I had written was a piece lasting seventeen minutes and consisting wholly of orchestral tissue without music--of one long, very gradual crescendo..."
Milhaud detested Wagner's music. When a young man wrote to him about Wagner's theories that all art "springs from suffering, unhappiness, and frustration," Milhaud wrote: "I am glad you decided to write me about your problem [with Wagner's theories]; here is my point of view, if you want it. I had a marvelously happy childhood. My wife is my companion, my collaborator; we are the best of friends, and this gives me great happiness. My son is a painter who works incessantly, and he is sweet and loving to his parents. Thus I can say that I've had a happy life, and if I compose, it's because I am in love with music and I wouldn't know how to do anything else . . . Your Wagner quote proves to me once again that he was an idiot." 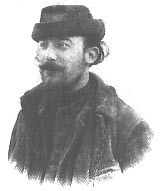 Erik Satie: What a Guy! O.K., I admit it. My interest in "classical" music is almost exclusively limited to 19th and 20th Century French composers: Erik Satie, Claude Debussy, Francis Poulenc, Darius Milhaud, Emmanuelle Chabrier and Maurice Ravel, to name just six. Satie is of particular interest to me starting back when I was 15 years old and heard an album of his compositions interpreted by orchestra and Moog synthesizer ("The Velvet Gentleman" circa 1970). Satie was a remarkably forward-thinking artist, changing aesthetic orientation endlessly, extremely eccentric (the dozen umbrellas, the dozen identical velvet suits, the handkerchiefs, the collars! ), he was greatly admired by Ravel and Debussy; a staunch anti-Wagnerian, seemed to be the first to explore Neo- classicism ("Socrate"), Minimalism ("Vexations"), Serial Music ("Entr'acte"), and much more, essentially invented the concept of background music (Muzak) in 1920; was the first to compose a synchronized film soundtrack (1924). Don't get me started on this guy, he seemed to do everything first, and then move on. However, if you click the ES link below you'll see a scan of a letter of his I bought. If you click on the whimsical Erik Satie to your right you'll go to his web page. In addition to writing several excellent books about Erik Satie, Professor Orledge has been an invaluable source of Satie sheet-music first editions (he is an avid collector and sells me his second copies). 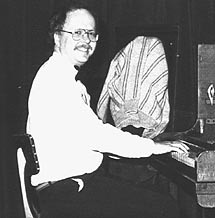 Professor Orledge apparently plays ragtime with great enthusiasm (see picture). Orledge's research interests focus also on other French composers of 1860-1950: Gabriel Faure, Claude Debussy, Charles Koechlin and Germaine Tailleferre. His main interest lies in composers' working methods, and his musicological "detective" work often seeks to trace the genesis of compositions from different versions and sketches, placing them in their historical perspective and evaluating them critically. He also has a special interest in theatre music. His "Satie Remembered" sheds new light on this oddly-compelling musician and artistic spirit who was, I believe, the most imaginative and innovative musician of the Twentieth Century. People often use the term "genius" rather freely when referring to talented people. A genius to me is someone who not only has remarkable and original ideas, but also a seemingly endless supply of remarkable and original ideas, as if they arrive from some mysterious source and are simply routed through the particular person. Musical geniuses include Paul McCartney (despite his vast amount of schlock), John Lennon, Brian Wilson, Charlie Parker, Miles Davis, Ray Charles ("the only genius in the business" said Frank Sinatra). There aren't many of them. 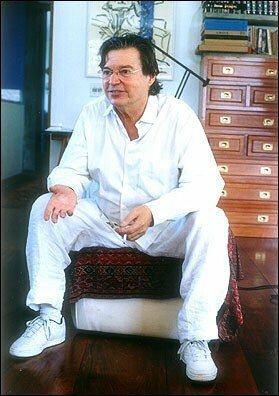 The great Brazilian composer Antonio "Tom" Carlos Jobim (1927-1994) was inarguably a musical genius, the great popularizer of "Bossa Nova" ("new thing" in Portugese) and the composer of such popular tunes as "Girl From Ipanema," "One Note Samba," "Wave," "Corcovado (Quiet Nights of Quiet Stars)," "Desafinado (Slightly Out of Tune)," "Dindi," "Insensatez (How Insensitive)," "Agua de Beber (Water to Drink)," and hundreds more. His ability to write a great melody, the complexity and beauty of his chord progressions, the remarkably complex rhythms inherent in the tunes are endless proof of his genius. Jobim created a large body of sophisticated beautiful songs that always seem to have a touch of melancholy under the gorgeous surface. The more you play his tunes (I play them on piano) the more you admire him. Jeez, they named the Rio de Janeiro airport after the guy! Imagine flying into George Gershwin Airport when you land in NYC and you'll get the idea. Jobim's music is, to me, like jazz with hipper and more varied rhythms and vast amounts of soul. To check out more about Jobim, go to Jobim Website. Talent is talent. 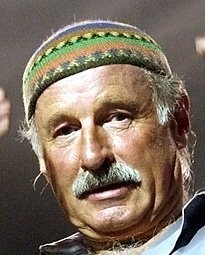 Joe Zawinul (1932--2007) was a brilliant and extremely soulful musician who began his career in the United States as Cannonball Adderley's keyboard player. 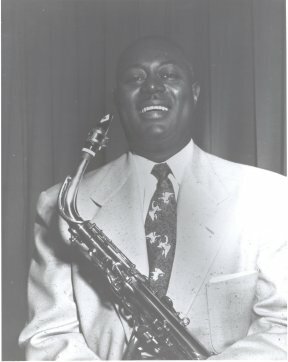 During this period he wrote the jazz standard "Mercy, Mercy, Mercy," a song so funky that Herbie Hancock later mused that Zawinul must have been black in a previous lifetime. This song was covered by the pop group The Buckinghams in the '60s and it was a big hit. In 1970 Zawinul formed the pioneering jazz fusion band Weather Report with saxophonist Wayne Shorter, and proceeded to win every jazz award and pack concert halls around the world. His song "Birdland" was a big hit and Manhattan Transfer recorded a pop version of the tune. After Weather Report broke up he formed the Joe Zawinul Syndicate and made more great music. I heard him play at Jazz Alley in Seattle and he was phenomenal...the best sounding synthesizer playing I've ever heard. And the joke is, the guy looked like a car mechanic on stage...like a regular "Joe." This Hungarian musical genius was warm and cool, prolific, tuned into "World Beat"music before it was considered a genre. Check out his "Brown Street" CD, extremely exciting big band arrangements of classic Weather Report tunes, and a definitive version of his composition "In a Silent Way.". Hungary put Zawinul on a postage stamp. 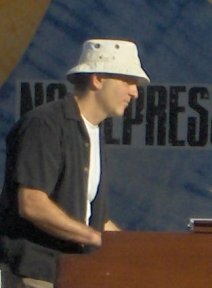 Joe Zawinul. Yeah. The Five Greatest Live Albums of All Time! Yep. Here, in no particular order, are the greatest examples of fabulous musical talent ever recorded in the history of the world. In case you were wondering. This was recorded in 1970 when everyone in the band was still alive--most notably, Duane Allman, and Berry Oakley, on slide guitar and bass respectively. These guys could play. I saw them back in August 1970 before their first album came out, at a local "Battle of the Bands" in Gainesville, Florida. They were simply incredible, the best live act I'd ever heard. When Greg Allman began singing "Cross to Bear," everyone looked around for the huge black dude who was obviously singing. Instead, the massively soulful vocal was coming from this skinny blonde kid on the organ, who looked like a surfer. This album has many highlights, but "Stormy Monday" is my fave. Check it out. There is a reason Frank Sinatra was considered one of the greatest pop singers of all time. This album proves it. He does a great standup shtick at one point, going on about what a drunk Dean Martin is, among other things. Then he sings. His backup band is the Count Basie Orchestra, and the arrangements are by a young Quincy Jones. You might say this 1966 Vegas show was an embarrasment of riches. My fave track is "Where or When." Jeez, there was something about the Sands in Las Vegas that made great live recordings. This set is from when Nat King Cole was headlining Vegas in 1960. All the other acts wanted to see and hear him play but were working the same time Nat was, so he did this special show for his fellow entertainers that started at about 2 in the morning. He is a great singer, but the kicker is an instrumental he does...."Where or When," the same cool tune Sinatra sings above. Nat King Cole was a terrifyingly gifted piano player. You have to hear his sound, his riffs, his overall touch on the piano on this track. He even does a novelty number called "Mr. Cole Won't Rock and Roll," and even his making fun of rock and roll...well, it rocks. The Who were a heck of a live act, especially when they were all alive, most notably Keith Moon. This three piece band plus a vocalist puts out more music than any rock act at the time. This 1970 live album is essential listening for any lover of rock music. Who? The Four Freshmen. They were the most astounding vocal group of all time, in my opinion. Brian Wilson admittedly stole their vocal sound and taught it to the rest of the Beach Boys. When you hear this record you'll understand why. Their jazz harmonies, four-part arrangements based on Stan Kenton's trombone section (I'm not kidding! ), were so advanced that no one has even come close to their sound. These four guys also played their own instruments as they sang...bass, drums, guitar, and doubles on trumpet, trombone, mellophone. I can honestly say that these four guys put out more singing and playing live, than any act you can imagine. This was recorded in 1958 at Compton Junior College in California. I bought an LP of this for 99 cents at a Goodwill Store as a joke, and I couldn't believe how amazing these guys sing. It's available as a two-fer on CD with a fairly tame other album. Yep, this really is one of the five greatest live albums of all time. They do versions of "Indian Summer" and "It's a Blue World" that are about as good as vocal arranging can be. Hey now. 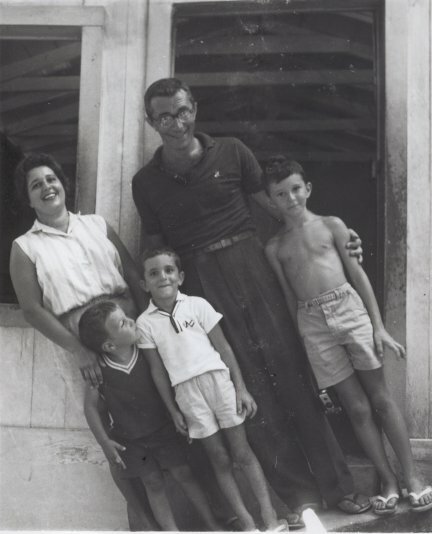 To go to a specific period in the memoir, click on any of the three links below the photo. For my fifth birthday I was given a tiny chihuahua puppy. I named him Pickles---and gee, but I loved him so! He started out as a charming little guy but as years passed, something terrible happened. 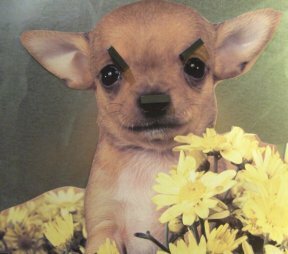 Pickles began scowling a lot (you don't want to see a chihuahua scowl), and he wouldn't fetch. Yes, Pickles became a Dark Chihuahua. We tried an exorcism but he bit the priest. This is the last photo I took of him before he bit me too. My parents dropped him off at the pound and then took me out for ice cream. I later learned from the pound that after traumatizing an Irish Wolfhound and cornering a good-natured Great Dane, Pickles was adopted by a wealthy Nebraska rancher. Pickles is now on a 1135-acre ranch on the Niobrara River helping to round up stray mustangs; intimidating grizzly bears, repelling wolves and standing his ground between coyotes and lambs. I'm glad Pickles has found an outlet for his Canine Explosive Anger Disorder (CEAD). In June 2002 I visited Florida and bought some groceries during the ten days I was there, in order to eat. On June 29th, Criston was my cashier that day. Many people write me and say,"Marty, what the heck did you eat while in Florida?" I can't for the life of me understand why anyone would care. But the people have a right to know. Rather than respond individually to each of these requests, I have posted this grocery store receipt on the "World Wide Web" to allow these people to speed the healing process, and "get a life." And there are some who still question the usefulness of the World Wide Web! Where Do You Go for the News? "...six huge corporations now control the major U.S. media: Rupert Murdoch's News Corporation (FOX, HarperCollins, New York Post, Weekly Standard, TV Guide, DirecTV and 35 TV stations), General Electric (NBC, CNBC, MSNBC, Telemundo, Bravo, Universal Pictures and 28 TV stations), Time Warner (AOL, CNN, Warner Bros, Time and its 130-plus magazines), Disney (ABC, Disney Channel, ESPN, 10 TV and 72 radio stations), Viacom (CBS, MTV, Nickelodeon, Paramount Pictures, Simon & Schuster and 183 U.S. radio stations), and Bertelsmann (Random House and its more than 120 imprints worldwide, and Grune + Jahr and its more than 110 magazines in 10 countries)." So do yourself a favor. Go to some other places for your news. Terrifying, but step outside the media bubble. Check out, oh...I don't know, how about Reuters News, the Moscow Post, or the Times of London or the British Broadcast Corporation (BBC), the always-entertaining Nebraska Farm Bureau, the shamelessly liberal Air America, or, what the heck, even the relatively unbiased Middle East Times. Hey, whoop it up. "Congress shall make no law...abridging the freedom of speech, or of the press." Gotta love that First Amendment. God Bless America...no, wait... God Bless the Whole World. Recording used to be a real big deal. You had to go to a place called a "recording studio" and pay lots of money per hour. It didn't feel natural in a studio, there was a lot of pressure to get it right the first time, and parking was a drag. Well, times have changed. With this new new-fangled "digital" gear you can record fast and cheap. I have a home recording studio, including a hard-disk recording unit that is about ten years old and truly NOT "cutting edge." But it doesn't matter. The other day (May 23rd 2008) I dug out an old Herb Alpert and the Tijuana Brass LP called "Whipped Cream and Other Delights." Aside from the awesome cover, the songs were great. One song, "Tangerine," caught my attention, so I decided to cut my own version. I did this in a day, playing all the instruments and mixing it. I've put the track on the website to see if I could figure out how. If you can hear the song, I figured out how. Thanks for making it this far. You're brave. Now check out Roger McGuinn. He is cool.